Greetings from the midst of the madness. Things have been unexpectedly hectic, but hectic with exciting new creative projects, so it’s not too bad! Here is a brief update of some of the things that have been going on! 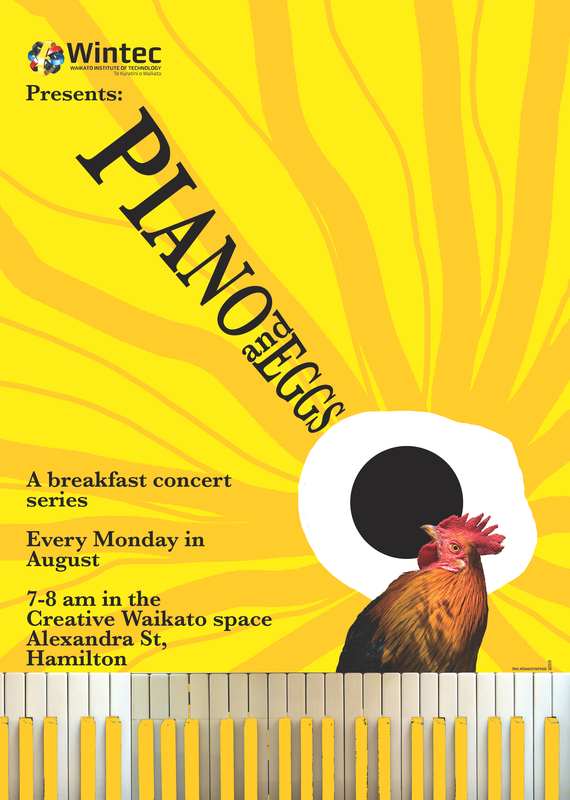 I have been working with the crew in the Music Department in the School of Media Arts, Wintec to curate and present “PIANO & EGGS” – a new series of breakfast concerts held every Monday morning (7-8am) during August in the Creative Waikato / Miltons Canteen space on Alexandra Street in Hamilton. Concerts are typically reserved for evenings towards the end of the week, providing a closing reward to the pressures of working life. So we thought, wouldn’t it be great if there was a way to kick off your week with an early reward and enjoy your morning coffee and breakfast accompanied by some live music? Monday 1st August: 7-8am – Jeremy Mayall and Kent Macpherson present a unique blend of minimal piano and electronic sounds, to create some textured, sonic explorations of early morning sounds. This combinations makes it a perfect calm listen to relax into your day, whilst at the same time creating something with a danceable quality that can energise you. Monday 8th August: 7-8am – A multi-media event. Kick off this week as a part of the annual SPARK International Festival of Music, Media, Arts and Design. This concert combines the work of musicians Jeremy Mayall, Kent Macpherson, and Yotam Levy, with the live visual art projection work of Paul Bradley. These performers will work together to create a truly otherworldly early morning experience. YOU CAN WATCH THE RECORDING OF THE LIVE STREAM BELOW! 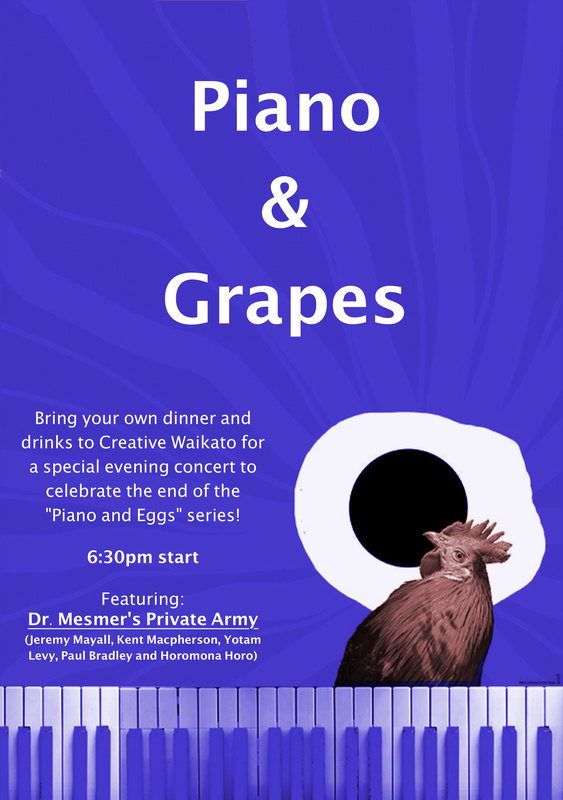 Monday 15th August: 7-8am – The half-way point in the Piano and Eggs journey showcases pianist Liam Wooding, who will be performing an eclectic selection of contemporary classical works from a range of composers. Monday 22nd August: 7-8am – David Sidwell, pianist and Emma Carpenter, vocalist will present a selection of musical theatre classics, original material and light opera. Monday 29th August: 7-8am – For the final in this series, David Sidwell is joined by soprano Julia Booth, with a collection of tunes drawing from light opera and musical theatre, along with a few original musical treats. Blood Sugar from Loading Docs on Vimeo. Working on a new art film project with Dan Inglis – to be premiered at an exhibition in September… more details to come soon! In the meantime here is a shot from the production. Have also been sitting down with director Julia Reynolds to talk about the score for her film SHEPHERD… Looking forward to getting stuck into this project. L.O.Q.Shun – a film project with Dan Inglis and Julia Booth has been touring around the world as a part of the 2016 DELETE TV Programme. It is a collection of new music videos from around the place. An interesting place to find and explore contemporary music. STICK TO YOUR GUN – a short film by Joe Hitchcock premiered at the PALM SPRINGS INTERNATIONAL FILM FESTIVAL! Awesome for this little project to get some air time at a top ranked festival. Stick To Your Gun – Trailer from Morgan Leigh Stewart on Vimeo. JEREMY MAYALL: The Effect of Bundled Sticks on Sound from SOUNZ on Vimeo. Next up… working on an exhibition in September in Hamilton, another exhibition in China, writing some new kids songs with Chris Lam Sam, and co-producing a kapahaka album… plenty to do!